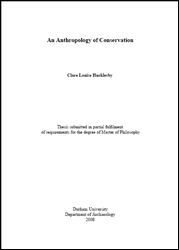 Clare Louise Hucklesby, An Anthropology of Conservation, Durham, Durham University, 2008. Are there common threads associated with approaches to the care of material culture and its conservation? What type of artefacts do different cultures retain and preserve? Why do cultures conserve and how do they achieve this? Does conservation actually exist outside of the remit of ‘modern’ (Western) conservation? Accessibility to literature and artefacts helped to narrow the field of study and the following social groups were selected for in depth analysis representing a range of temporal and spatial variables : Ancient Egyptian; British Regimental Culture; Native American: Roman; Aboriginal and Maori; and Modern British Culture. In order to collect the large volume of information required for this endeavour, a data-gathering tool, in for form of a structured questionnaire, was developed and refined. The tool allows for the critical analysis of conserved artefacts through the viewing of either objects, conservation reports, images of conserved artefacts, treatment-based articles or a combination of the above data. An early hypothesis to emerge focuses on how value is perceived in artefacts and how value influences conservation effort and he point in an object’s life when conservative effort is likely to be attempted. This thesis aims to reveal the conservation systems practised by the selected cultural groups and to critically address the research questions. It is intended that the synthesis will broaden theoretical understanding of approaches to conservation.